Built for freeride or slope style, this soft DRYEDGE 2L eco-designed jacket provides warmth and weather protection. 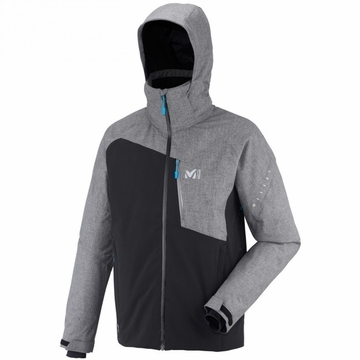 This laminate from MILLET forms a weather barrier against snow and wind, while allowing high breathability. It boasts stretch fabric on most of the body, enhancing free movement, and combines a heathered fabric for a stylish look. Warm and lightweight, the polyester insulation will maintain a comfortable level of thermal insulation in cold weather conditions. It has got all the functional features: vents, adjustable hood, snow skirt and jacket-to-pant connection.